Hello! 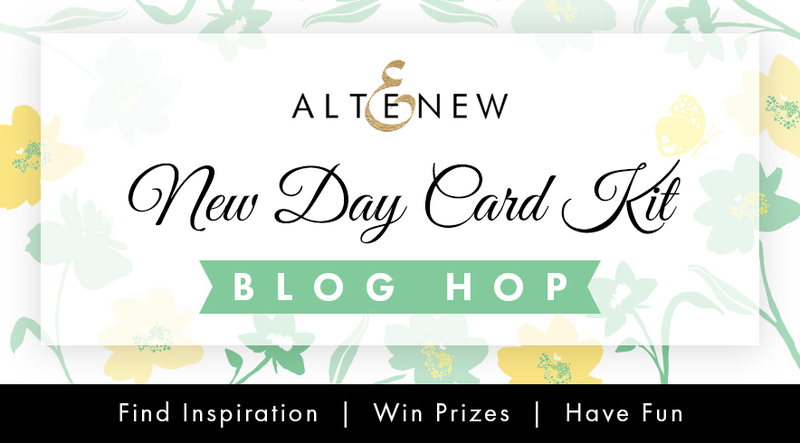 Today I am part of the Altenew New Day Card Kit Blog Hop. If you arrived from Laura Jane's Blog then you are in the right place. If not and you want to start from the beginning of the hop please visit the Altenew blog HERE. I have 5 cards to share using this kit. I really loved the rose paper in the paper pad so I used it as a background and added all my other elements along the bottom so that the rose is the star of the show. I added some glitter to the image for some more interest and to tie into the gold glitter tape along the bottom. My second card uses the tape on some of the color cardstock then I used the included dies to cut the hearts. For these cards I did some stamping on the pattern paper and embellished with some of the cut out pieces from the set and the colorful enamel dots. For my last card I used the fancy frame die to cut it from the included gold paper. I thought the small rose paper really went well with this style of the frame. I embellished with black enamel dots to help bring out the sentiment. 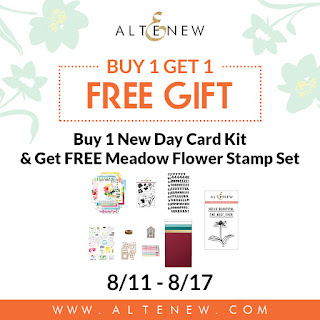 Also Receive a FREE Meadow Flower Stamp Set when you order the New Day Card Kit 8/11 through 8/17/2017 at 11:59 PM EDT. The free gift will be added to cart automatically. Not valid on previous orders. The next stop on the hop is Kimberly Crawford. Great cards! I love how you added little details to the large rose background paper... so pretty and clever. Beautiful cards! LOVE the hugs one - absolutely gorgeous! Fantastic array of cards. That patterned paper is divine, a must have for me! Thanks for a chance to win! Beautiful cards, all of them. I hope to be able to make cards like this one day - I'm a newbie to stamping! They are so elegent and cute.. great design and creation.. The papers in this kit look amazing! I love how you added glitter to the rose in the first card, very pretty! I love the frame die cut in this kit - very elegant. Oh my, these are beautiful! Beautiful cards! I could not begin to choose a fav! I love that big beautiful flower! So many beautiful colors make all of your cards look AMAZING! Beautiful cards! This kit is so fabulous!! Love them all especially the rose paper background with glitter at the bottom! i too love that big rose flower. Beautiful, stunning, gorgeous, breathtaking and absolutely magnificent are just a few words I would use to describe these cards! So many awesome elements in this wonderful kit! Wish I could make it mine! TFS! I LOVE this card kit and am so glad I ordered it when it was first released! Thank you for all the wonderful ideas! Love all your cards, but my favorite is the last one, beautiful colours! 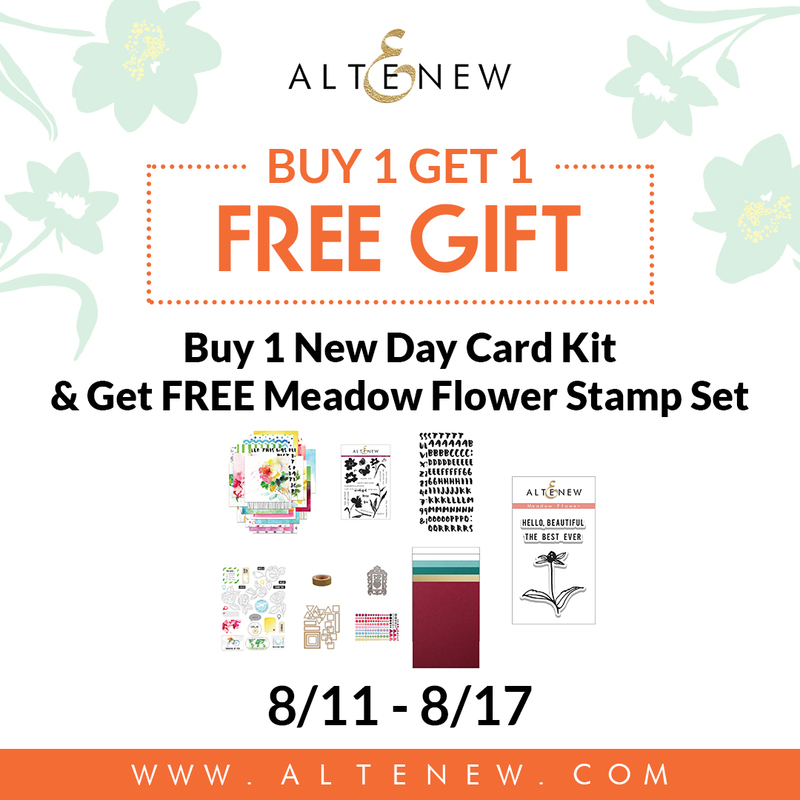 Your floral card designs are very beautiful! Fabulous cards - and a great kit too. I love the frame die. OOOHHH...So Pretty! I'm truly inspired. Beautiful bundle of cards ! Don't ask me to choose one, I just couldn't! Your Hugs card is inspiring, adding elements to patterned paper. And stamping on top of the patterned paper - it works great. Nice. Wow! I love all of these. Those papers are so pretty & I love your darling die cut hearts using the gold tape. Thanks so much. Great cards ! 💕 This frame die is very nice too. Wonderful cards, such variety! Really good use of the products. Do you realize how long it would take me to squeak out five cards?? And each one of them is gorgeous. Wow. I am always amazed when I get to opportunity to do a hop. (Which is seldom due to the lack of Internet where we live... I know in 2017, in the USA, there are places where high-speed Internet is still not available...) The creativity always amazes me. Fantastic cards and amazing patterned papers!Great kit!Thank you for the inspiration! This is a beautiful card kit. The paper is particularly lovely. These are so pretty, Chari! I love the card you made with the stamp on the patterned paper. The die cut frame is gorgeous too! WOW Chari, these are ALL great but the last one is a total stunner. Very well done. 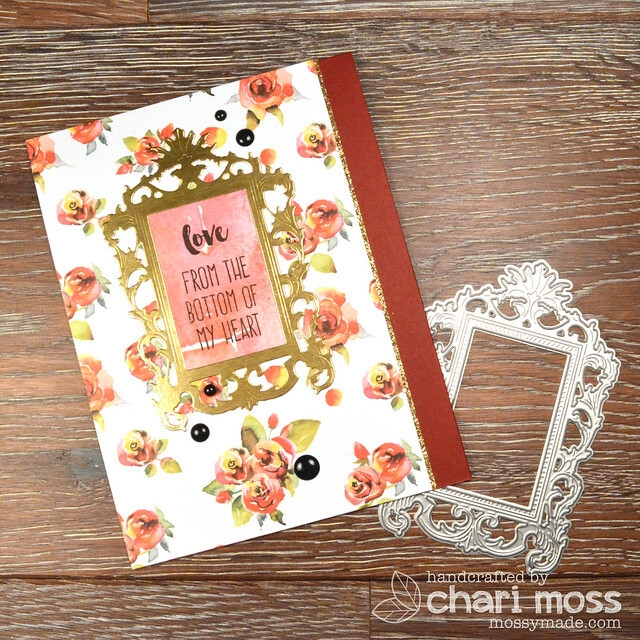 Stunning cards, Chari! The rose paper is so beautiful! I would want the kit just for the patterned papers! All of your cards are fabulous, I cannot choose a favorite. Thanks for showing so many great possibilites with this kit! Beautiful cards, especially the one stamped on pattern paper! Fantastic creations with great products! TFS! 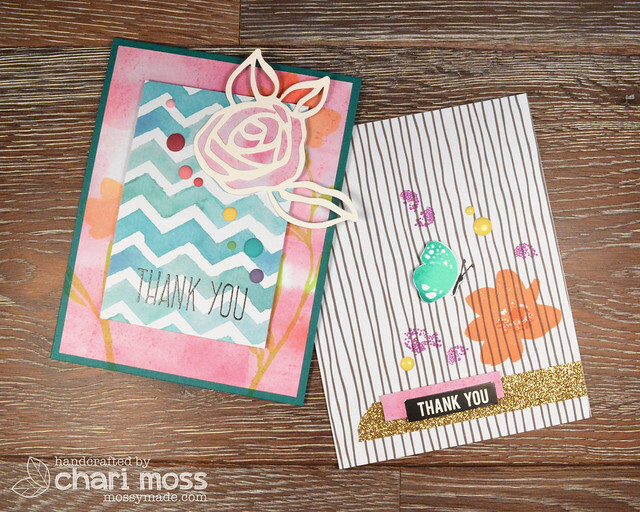 You did some lovely things with those gorgeous patterned papers Chari. I loved when you stamped on them. Turned out beautifully. What an amazing array of cards ..All of your cards are just so beautiful .So many amazing ways to use this card kit.I love your inspiration !! 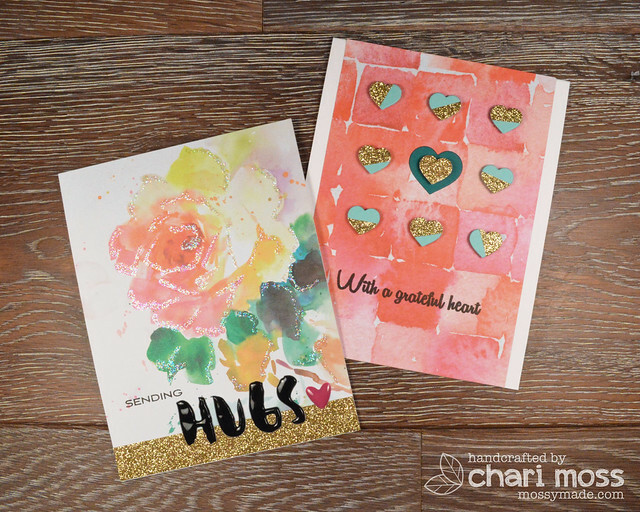 Love your beautiful cards, Chari. Thanks for the inspiration. Enjoy your day! Loving all of your cards! Love your cards. Love the paper pack, too! All 5 are just lovely! This is a beautiful kit. The papers are extraordinary. Lovely cards. I think the hugs one is my favorite. Lovely cards Chari. The designer papers are so pretty! Especially the floral one... the gold frame looks wonderful! Great designs. wonderful cards using the fab papers from this kit - thanks for the good ideas!! Awesome cards, you did a great job of highlighting the papers! That rose just knocks my socks off!! Beautiful! Great kit! Love the way you used the paint patches paper. Wow I love your cards! 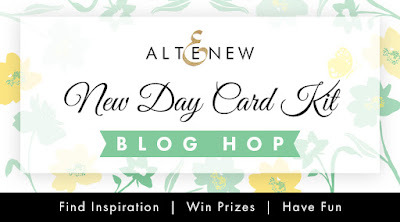 This blog hop is making me impatient. Can't wait to get my kit...your cards are knspiring! This sure is a fun card kit. So many beautiful cards from this one kit----it is awesome! Thanks for your inspiration! Great cards. I like the gold on the cards. Wow, what a bunch of gorgeous cards!! I really adore the frame in this set; it is so elegant. So, of course, I love your last card, but my favorite is that rose card!! How stunning! And the added bit of glitter is perfect! Love the gold glitter embossing on the hearts! FABULOUS kit and WONDERFUL cards! LOVE the colours and splash of sparkle! Such wonderful examples of ways to use the beautiful pattern paper in the kit. Love the gold sparkle embossing on the rose in card 1. Fabulous cards! Each one is truly a delight! Love the stamps and dies that are in this kit! The fancy frame is awesome! Such beautiful cards from such a beautiful kit! I like your ideas for using the glitter tape on so many cards. Your cards are stunning! I love the added touches. Beautiful kit. I love the vibrant colors. Love all the gold, fabulous way you made the hearts and beautiful frame. Beautiful cards! That one with the big floral print is my favorite, so pretty! Such beautiful cards! Great job creating wonderful art. Wondrful designs! Fabulous way to use the pattern papers, love that glittery watercolor rose! Thanks for the inspiration! Wow! So pretty!! Love your cards! Wow! So many amazing cards! Thanks for sharing! The frame needs to come home with me! What fun you have had with these pretty papers!